The cuisine that belongs to the people known as “Germans from Russia” is truly a peasant cuisine. It is humble - close to the land - because it comes from the land; it is versatile and it makes the best use of available ingredients in order to nourish those who work hard to reap the bounty from the land. As is typical of peasant food, German-Russian foods also manage to be easy to prepare and taste delicious - something to look forward to after a long day toiling in the fields. These qualities are, in my opinion, some of the best and most virtuous that a cuisine can have. Knoephla is a quintessential “German-Russian” staple that easily demonstrates these traits, and more. A close relative of spätzle, somewhere between a home-made egg noodle and a dumpling, knoephla (spelled in various ways such as knoefla, knöpfle, knefla, knephla, knopfle and others) is a simple, convenient, scrumptious way to stretch any food budget in order to feed an entire family. Knoephla is also closely related to nokedli in Hungary, kluski in Poland and gnocchi in Italy; indeed, knoephla dumplings bear a striking resemblance to halušky, which are a household fixture in my wife’s ancestral land of Slovakia. 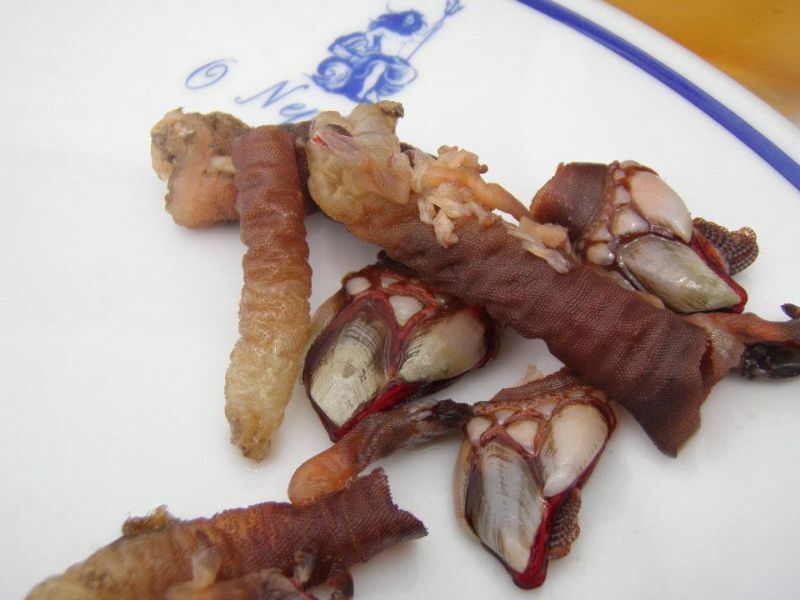 There are many variations on the same theme throughout Europe, all claiming to be the original; however, knoephla is unique in that it has persevered through migration, privation, culture shock and acculturation with little or no change in its basic nature. 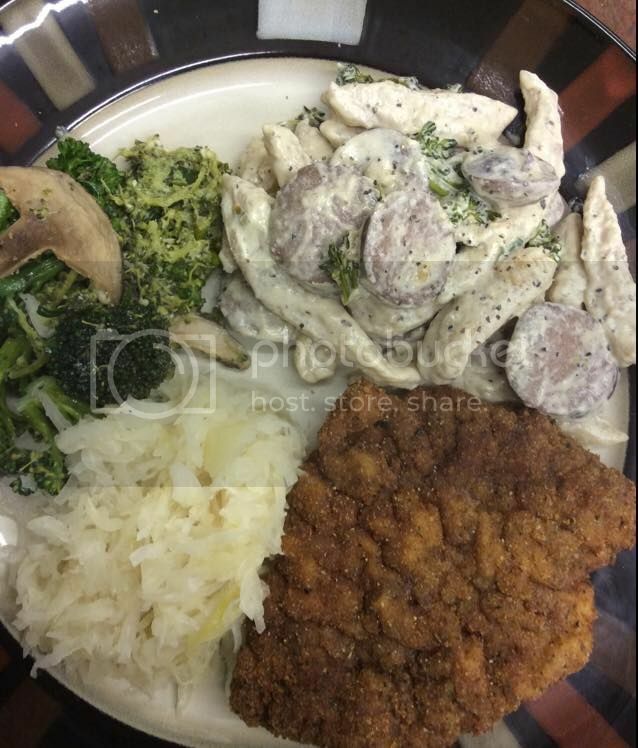 It is an aspect of German-Russian cuisine that was and still is nearly universal in homes from Kansas to Saskatchewan; consequently, the mere mention of this common food will conjure happy, nostalgic memories and associations, recalling childhood meals at kitchen tables, family celebrations in community halls and church suppers long past. There are several other types of dumplings in German-Russian culture, including dampfnudeln, butter balls, knoedel; even spätzle itself - but today, we are going to talk about knoephla, and leave those others to later discussions. In German-Russian homes, knoephla was often used as a “noodle” in soups - but not always; just as often, it was also served alongside any dish that had a thick gravy or sauce, much as we would serve mashed potatoes in the U.S. Other times, knoephla would be served by itself, sometimes with vegetables or meats added, and perhaps a butter or cream sauce. This knoephla hotdish is one such example. It is a throwback to the eintöpfe of the Swabian and Alsatian regions that spawned the Germans who went on to settle in Russia’s Empire, many of whom had descendants who would eventually emigrate to the Great Plains of North America. I did not realise it until Brook (HistoricFoodie) pointed it out, but the term “hotdish” seems to be rather regional, occurring primarily in the same territory as the German-Russian settlements in the New World. It is a word that describes a food that is somewhere between a “stew” and a “casserole,” and encompasses the same “one pot meal” idea as the eintöpfe of Germany. It can apply to many styles of food made from a variety of ingredients, but basically involves a meat and a starch or grain being brought together and prepared in a single vessel, often supplemented with a vegetable of some kind, all united by some sort of thick gravy or sauce. This concept can of course be found in many foods among many cultures, but as far as Brook can tell, the term “hotdish” is unique to this area and is a direct descendent of the eintöpfe that were so common in the areas that the Germans from Russia originally came from. Since I grew up with the term, I never really thought much of it and instinctively knew what a hotdish was; however, it was an entirely new term for Brook, even though the concept behind it was recognisable enough. 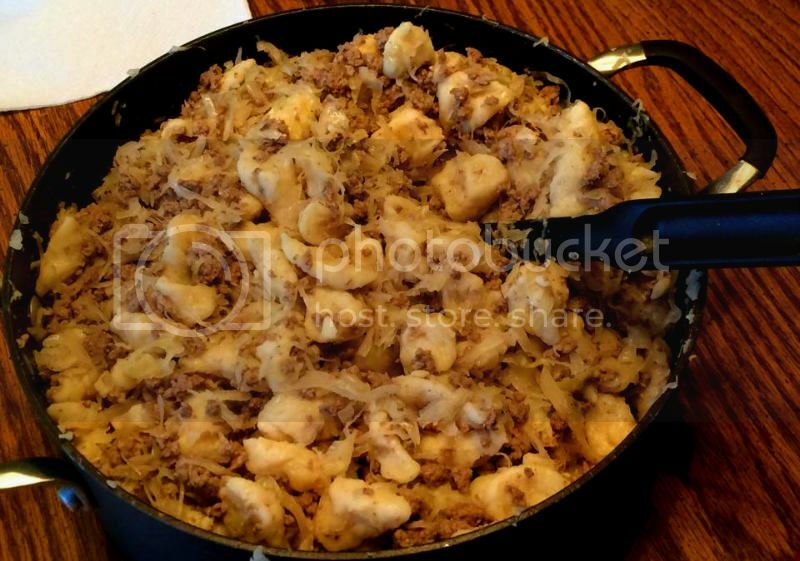 This is a filling, satisfying dish that a good, resourceful German-Russian wife - who spent her entire day tending the farmstead and the younger children - could prepare for her hard-working husband and older children as they returned from a day of toiling in the fields. While I abhor the use of the word “cheap,” it is also a very frugal dish, using ingredients that would be found in any rural pantry or larder, and can be adapted to whatever is on hand at the time. 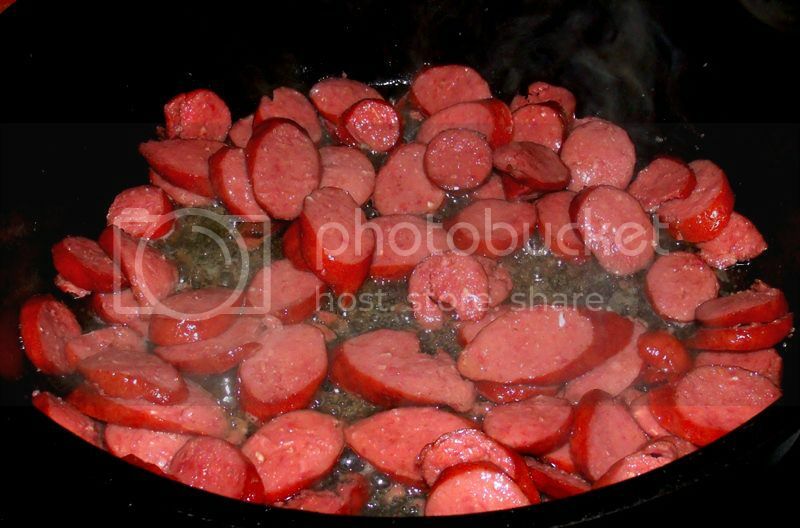 My own preparation uses smoked sausage, making this a Knöpfle und Wurst Eintöpf; however, it can also be made with fresh sausage, ham, bacon ends and pieces, chunks of beef, ground beef, venison, chicken or any other meat; it can also, if one wishes, be supplemented with cabbage, sauerkraut or garden vegetables, which would be added during preparation. I have included these concepts in the recipe below, but please do not limit yourself to what I have written, as the base recipe can be adapted in many ways. Start a kettle of water heating to a boil, adding a little salt to season. Combine the flour and salt in a mixing bowl. Make a well in the center of the flour and beat in the egg, then add the water. 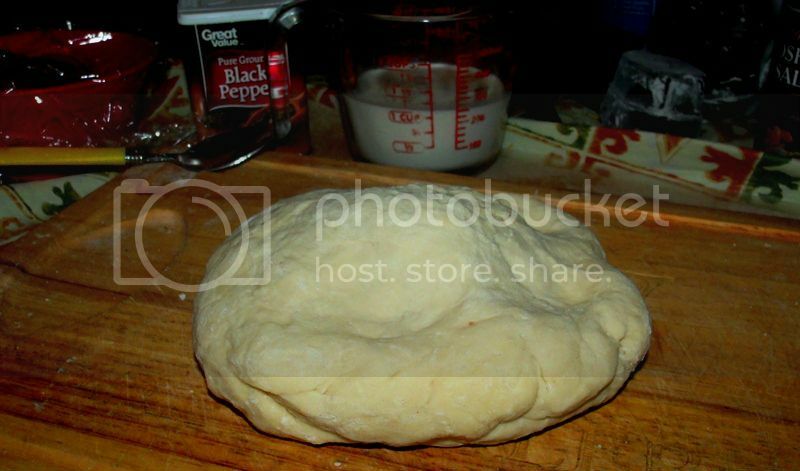 Work the flour into a fairly stiff dough; you may need to add a very small amount of flour or water to get the right consistency. Work the dough into a ball; cover it and let it rest. Begin cooking your meat in a large skillet or Dutch oven, adding a diced onion if you choose. Depending on the meat that you use, you may need to heat a little bit of oil or other fat before cooking. Partially flatten the ball of knoephla dough, then pinch off bits of it into the boiling water, rotating the dough in your other hand as you work. Alternately, you can snip the dumplings off with a sharp knife or kitchen shears. Boil the knoephla 5 to 10 minutes, or until all of the dumplings are floating on top of the water. 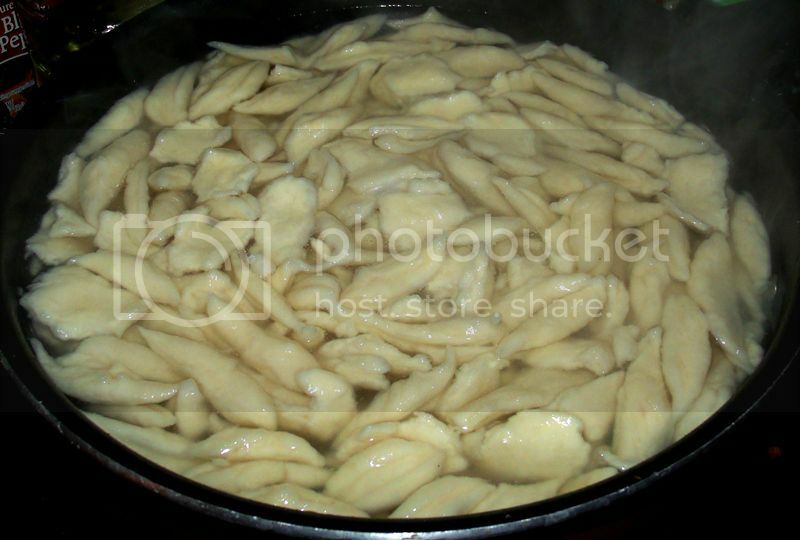 Strain the water out of the dumplings, then add them to the meat that you are cooking. If you are preparing this meal with chopped cabbage or another vegetable, add it at this time. Reduce heat and cook for a few minutes, stirring now and then in order to keep the knoephla from sticking to the bottom of the pan. 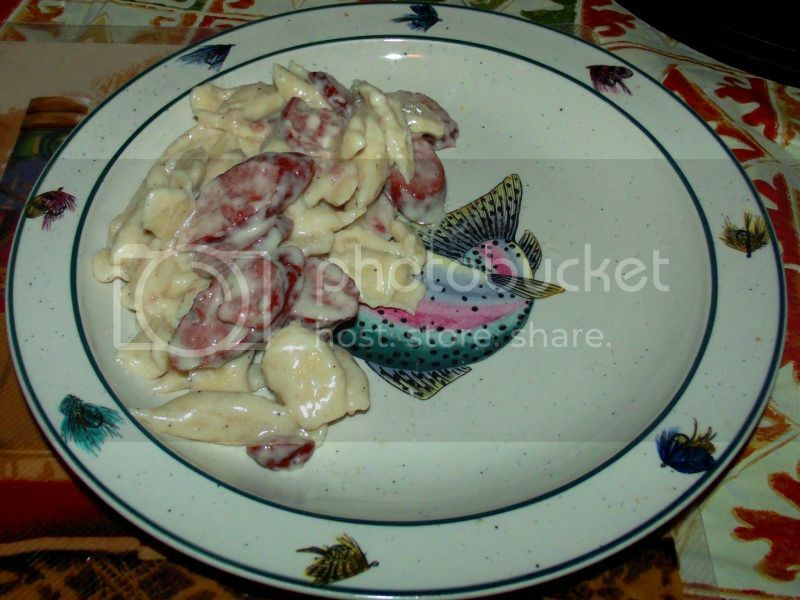 Meanwhile, combine the cream, pepper and chicken stock in a measuring cup or small bowl, pour the mixture onto the meat and knoephla and heat through, stirring occasionally, until a creamy sauce develops and the cabbage (if used) is cooked down. If you are preparing this with sauerkraut, stir it in at this time. Stir a few moments until the meal is heated through, then serve. When made with the optional ingredients, this is a meal it itself, or you can serve it with a vegetable side dish of your choosing. This dish is ridiculously easy to make, which makes it a good example of the food that typifies German-Russian cooking; in fact, it almost takes more time to read this than it does to make the dish! Lets get started…. Looking back, I could have done this while the knoephla dough rested (see below), but it’s all good. You may have to add a little flour or water to get the consistency right, but the dough should be fairly stiff; this dough is probably just slightly stiffer than it needed to be, but not by much. The reason for the flattened shape is so that it is easier (in my opinion) to shave, cut or pinch the knoephla off into the boiling water. While the dough is resting, begin cooking your meat in a large skillet or Dutch oven, stirring as needed. 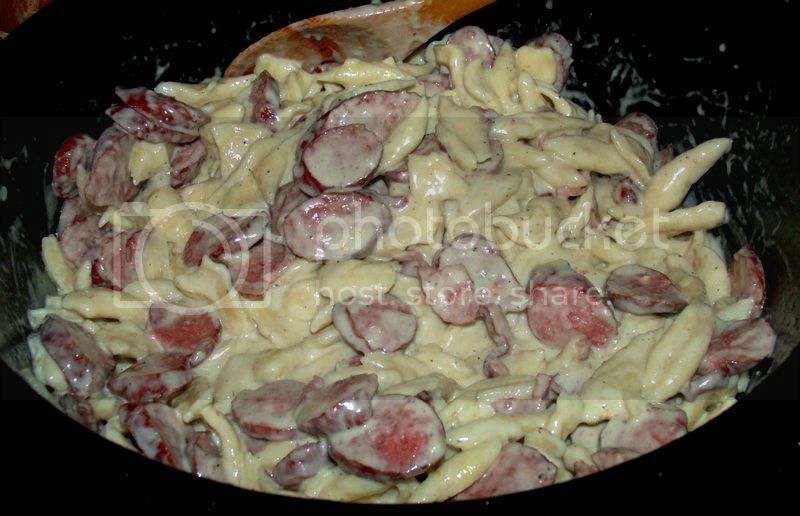 I chose smoked sausage for this dish, but as mentioned above, you can use any meat that you prefer or have on hand. Sausage, ground beef and some other meats will make their own fat as they cook, but if you use a lean meat, you will need to cook it with some kind of fat; to keep it in traditional German-Russian fashion, use rendered lard, schmaltz, sunflower oil or perhaps butter. If you are adding a chopped onion to your hotdish, now is the time! If you are adding chopped cabbage or some other garden vegetables to your hotdish, do so now, so that it has time to cook down. From this point, you will need to stir rather often, so that the knoephla will not stick or burn to the bottom of the pan. Now comes the part that makes this meal wonderfully unique and exceedingly tasty! Measure 1 cup of your cream, then add black pepper to taste and a tablespoon of chicken or other stock. I used about 2 teaspoons of pepper, but I think the dish could have used a little more. For the stock, I used a nice, home-made chicken and vegetable stock that my youngest son had made the day before; he had reduced it down almost to a demi-glace, and it made a really nice impression on the dish. If you are adding sauerkraut to your hotdish, now is the time to do so; allow the dish to cook a few additional minutes, stirring occasionally, then serve. One bite of this will make you glad that you tried it! The knoephla were light and slightly toothsome, picking up the other flavours and carrying the sauce very well. The smoked sausage that I used was an excellent choice, lending a savory, outdoorsy quality to the dish that was hard to resist. The creamy sauce was also quite a treat, almost cheesy in its richness, as it provided body and cohesion to the hotdish, making it a perfect supper after a cold winter day. Her preparation uses ground beef with sauerkraut stirred in; I believe that there is also a chopped onion in there as well. 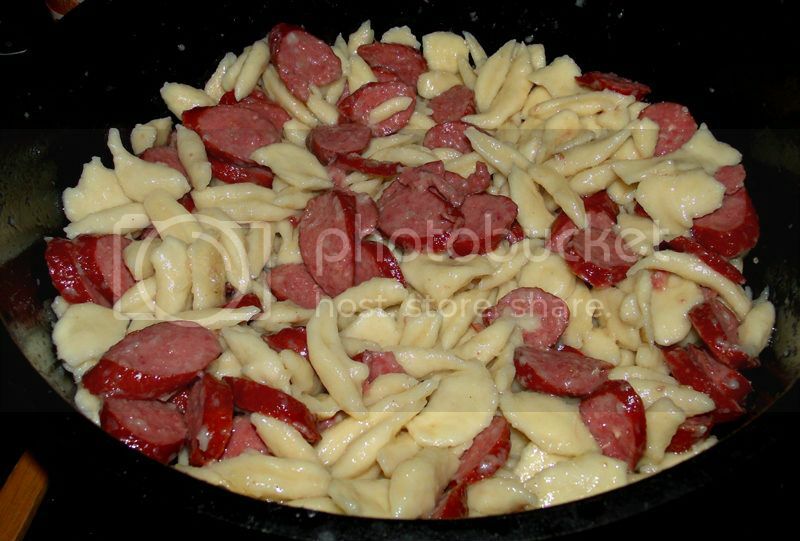 For the ethnic group known as Germans from Russia, this is an iconic meal that can be found in various-yet-familiar forms from Saskatchewan down to Kansas; but if you happen to live outside that corridor, do not despair! You too can fall in love with this hotdish; all you have to do is give it a try. Thank you for taking the time to read this; as always, if anyone has any questions, comments or other feedback, please feel free to post them here, and if you try this, please share your experience with us. That looks and sounds fantastic! I expect to be snowed in tomorrow. Maybe I should learn to make dumplings. Join the club Melissa....we're getting another foot or so tomorrow as well. I have a stir fry on the menu. 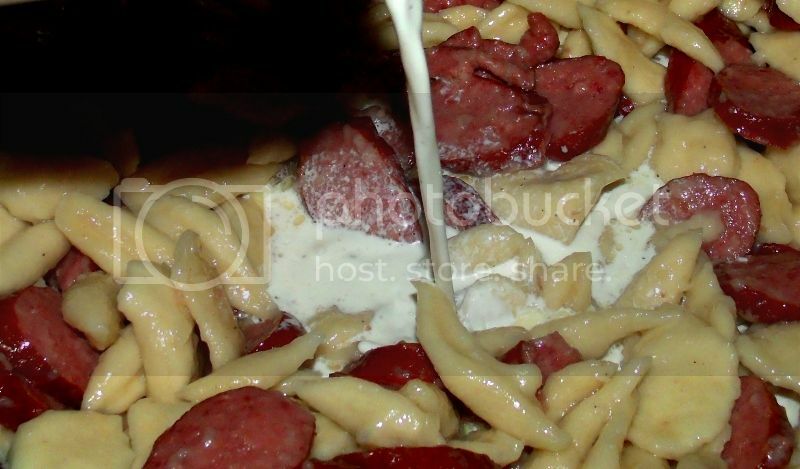 Very similar to a lot of Croatian food. We have nokli as well, but I'm a lot more familiar with it in a thin stew. Still snowing. I got out my old bread machine. Looks pretty good, I'd say! This is the perfect time of year to give this a try, so go for it! Looks like fine fare to me. Reminds me of the potato dumplings of the Nebraska Czechs I used to know. Since it's just me and Ma most nights any more, I wonder if you could use half the dough and freeze the rest, cooked or uncooked. Any ideas? And yep - from I've seen, the un-cooked dough freezes very well, indeed! Cooked, I'm not so sure - but it wouldn't cost much to find out. The cooked dumplings freeze just fine. Reheat them gently in the nuke, or dip them in boiling water just long enough to heat through. Thanks guys, especially for the halusky reipe. I had forgotten their name for dumplings. I have looked before for recipes and even tried a couple but have never been satisfied. Food from the ladies of Dwight, Neb. may be in the same category as that from Grandma's kitchen--never gonna be right done otherwise by anyone else. 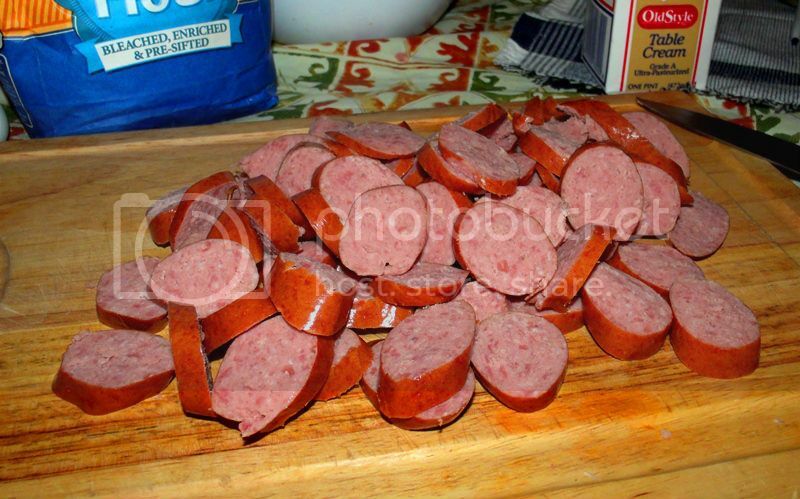 The knoefla is on the menu tonight using cheddar brats. Probably a side of creamed cabbage. That sounds delicious, Tom - let us know how it turns out, and if you get a photo or two, post 'em up! Just looked at the halusky recipe. That will be on a menu soon. Don't know why, but the ones made by the ladies of Dwight were always hand rolled into a torpedo shape. Also noticed while there a recipe for kolachys that I'll be chasing down. As German as I am, I have to admit that kolachys may be the best pastry ever. I have not made Knoephla since my apprentice days in a large Calgary hotel. 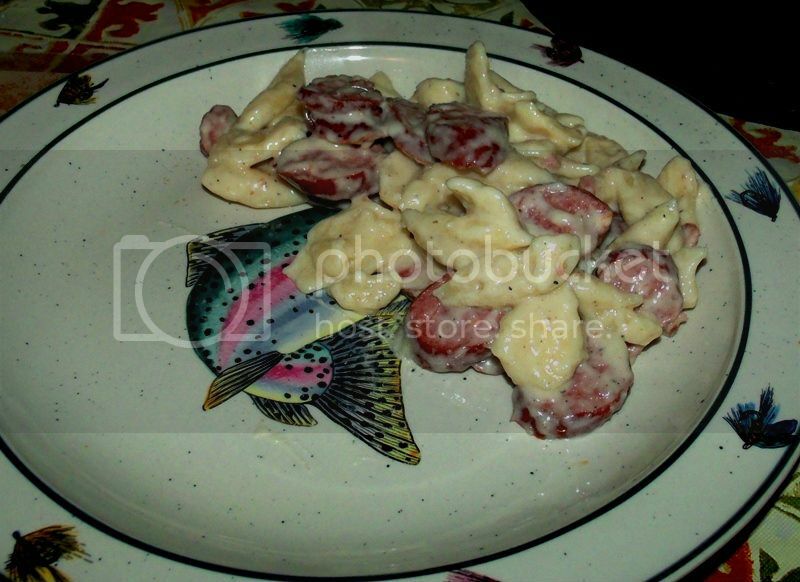 Mrs. Percebes has pleaded with me to produce a special Turkey Kielbasa specifically to produce this dish. She is unable to eat pork due to a sensitivity. 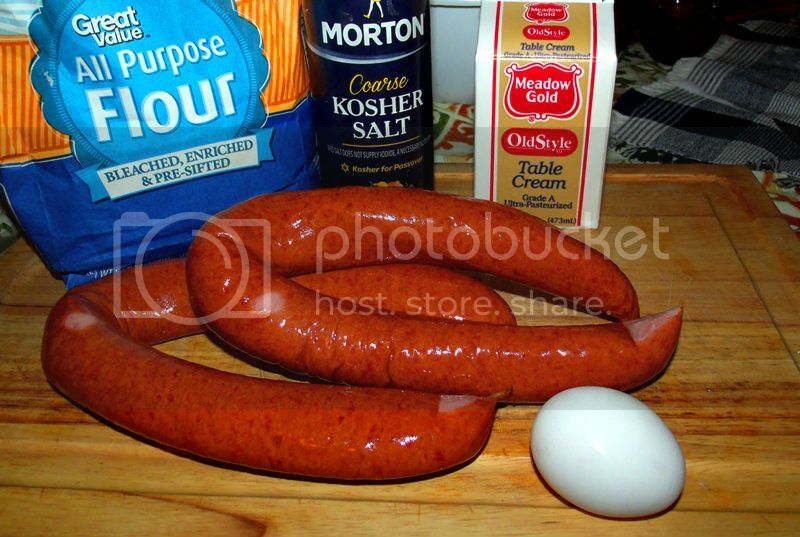 Turkeys on sale this week and so I will produce the Turkey Kielbasa tomorrow. Any news on this? It's that time of year! I actually know exactly how that feels! Our temperatures went down this morning, from 38 below zero to 41 below zero, without the wind shill factor. They are slowly on the rise now (currently at 24 below zero), but I figured that today would be a good day to bring this to the top.